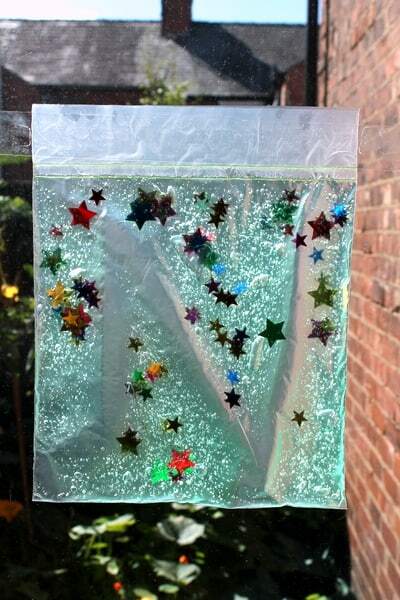 These sensory bags made using gel are wonderful for using our senses of touch and sight, and combine especially well with the sunshine. 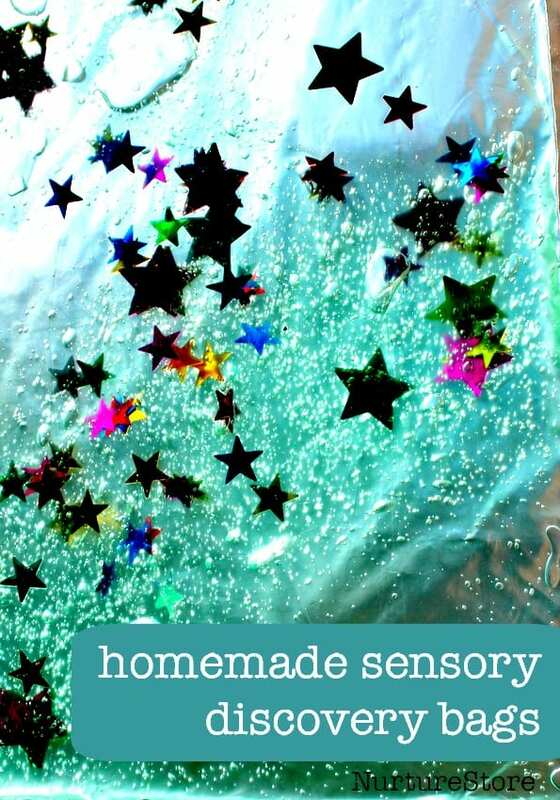 Here’s how to make sensory bags and ideas for using them for sensory play activities. 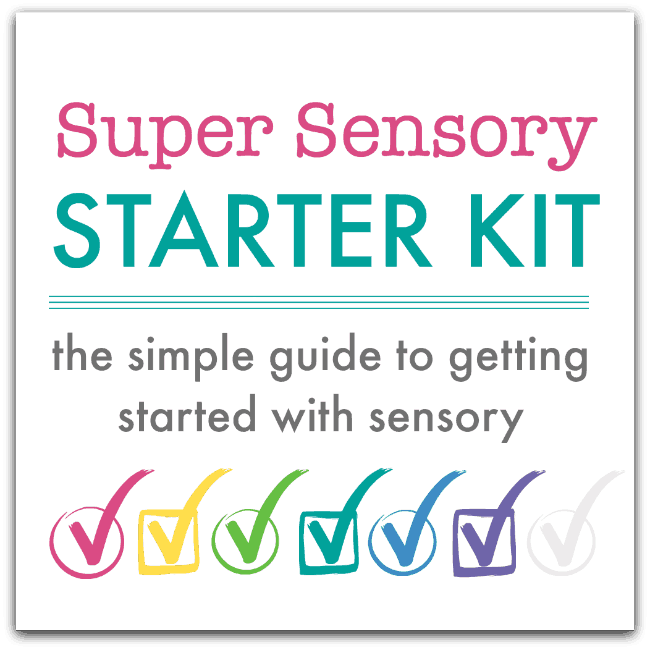 While all the ingredients are contained inside the sensory bag, do make sure all fastenings are secure so nothing can escape and end up in your baby’s or toddler’s reach, and always supervise all the time they are playing. 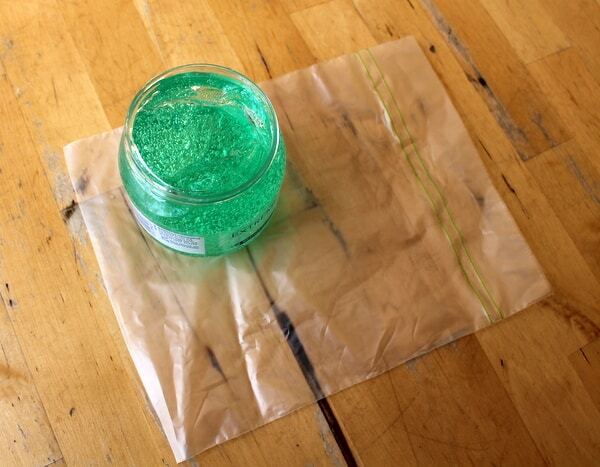 You need just two basic ingredients for your sensory bags: a strong, clear, plastic food bag, and some hair gel. Your bag need to be strong enough to withstand handling by your child, so make sure you use something substantial. You can double up, with one bag inside another, and you can add extra tape around all four sides to secure it. Fill the bag with some of the hair gel. 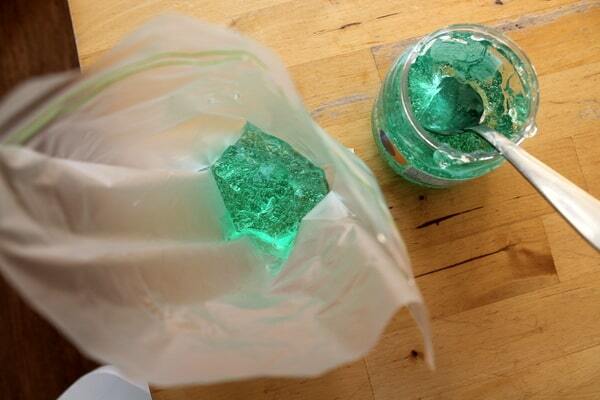 You don’t need very much gel, just enough so it can spread it out in a thin layer and fill the bag. 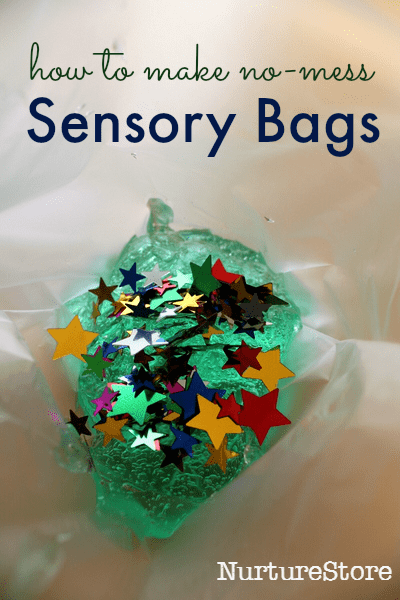 The gel-filled bag alone is great for sensory play, as it has an interesting texture for your child to explore, but there are many other ingredients you can include to offer different sensory experiences. :: you could make a whole row of bags along a shelf or table, with different items inside each one – a sensory treasure hunt! :: practise hand-eye co-ordination. Draw a maze on a piece of paper and place it under the sensory bag. Then see if you can use your finger to move one of the items inside the gel around the bag and through the maze. :: use them to learn spelling. Use your finger as a pencil to write letter shapes into the gel – a super, sensory way to learn to spell! I love this idea but would prefer to have a more eco-friendly material than hair gel, so I could compost it when I am finished. Any ideas? Hi Jill. I’m not sure. I was thinking mainly water with some flour to thicken would perhaps give you a gel-like consistency. Or jelly/jello/gelatine if you’re OK with using food for play. If you work out an alternative, do let me know. What about cooking tapioca or sago until clear? What about coconut oil? That would work well, I’d imagine. I have done similar wth children’s toothpaste! The little ones really enjoyed it. I made sure to double bag it and duct taped it so it they couldn’t open it! You could use apple jelly! 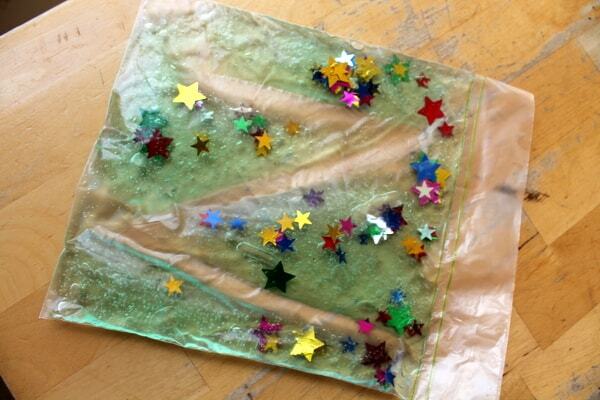 How old is your little one when you introduce these sensory bags? Hi Cynthia. You can start them very young – they can be great for tummy time so long as your baby is able to confidently hold their head up. You can tape a bag to the floor in front of your baby and play with the bag together. When they are able to sit up, you can also tape the bags to a table or the tray of their high-chair. In a preschool where I worked the nursery staff would put pudding directly on the high chair tray and allow the babies to slap and swirl it around. Lots of mess but non toxic and the babies are washable. lol Puddings would work well inside a busy bag and would decompose better than the plastic zip bag would. Any ideas for sensory bags for age 4-5 yr olds? I’d like to have my students make this on the last day of school! Hair gel looks great as a filling. Your students could draw themselves, you could laminate their illustrations, and then they could pop their mini-me inside the bag to go for a swim in the ocean? Or you could have some letter shapes and they could pick out the letters of their name to go in their bag. Where do you purchase the strong, clear plastic food bags pictured above? I have not been satisfied with the bags I have tried so far. I am looking to find something stronger and free of any labels. Thanks! Hi Alana. I think these will have been from the supermarket – Tesco most likely. I’ve found it harder recently to find bags without writing on though, so good luck! I’ve read that you can remove the writing on the bag by rubbing with a bit of nail polish remover on a cotton ball. I haven’t tried it yet, but I intend to! Thanks for sharing this tip Tiffany!